Last month I made an appointment to "Cut the Line" at our local Everlane shop on Valencia street and check out the summer collection. It is one of two new brick and mortar locations for the company (say goodbye to online returns). Megan and I have been watching this brand for several years--attending open houses at their studio space. We love the business concept but have never been sold on the fit. However, we are open-minded fashionista's and are willing to revisit a brand we want to believe in. In short, I was extremely impressed with their current collection and the store experience. I actually had fun shopping! Perhaps it had something to do with the fact that my appointment was a 9:30 on a Saturday morning and I had the place to myself. ProTip: When visiting a new brand, be strategic in your shopping. Start by pulling the top styles you like and a few you don't. The goal is to get to know the fit. I pulled nearly every pant style they had in a size above and below by usual to get a sense of sizing grading. Once you have nailed down your "true size" then focus on the color that best works on you and your wardrobe. While sales people can be helpful, having all the sizes you need first will save you time in the long run. Who shops for sweaters in summer, I DO of course! If you are in need of a casual summer sweater that is comfy, breathable and still upbeat for the season this is it. Wearing black in June and July only adds to the misery of our SF climate. This fun pop of color was so popular I actually passed this sweater to a fellow patron in the dressing room...yes I will occasionally style others on the fly. This color has since sold out, but they have a slew of other amazing colors. Shopping for white summer jeans can be an exercise in humility. The shopping experience is akin to bathing suit shopping depending on fabric, cut and dreaded dressing room lighting. Luckily, Everlane is a step ahead with dressing rooms that are filled with soft natural light thanks to well placed skylights. The fabric on these bone colored jeans has the right about of thickness to support and smooth. The cut of the high-rise kick crop pant is clean with a playful flair. I especially apprecited the raw hem for a touch of modernity. Everlane Wide Leg Crop Pant $68 (Front shot shown in Ochre) and Everlane Wide Leg Crop Utility Cargo Pant $68 (Back shot shown in Surplus). These sister styles are exactly what you want on a Saturday morning! Super comfy with a sprinkle of style. I preferred the Wide Leg Crop Utility Cargo pant with back patch pockets and front pocket detail. These styles run large, so size down and consider the stretch impact. The smallest size in store was still a little big on me that I decided to pass on these (for now). If I purchased either of these crops I would have altered them to two inches above my ankle for summer. ProTip: Everlane does not provide in store alterations so make sure you have your local tailor on call. Denim skirts have cycled in and out of my wardrobe over the years. This summer they are back and I love the super dark indigo versions. When I spotted this one in the shop I gave it a try and was pleasantly surprised by the fit. However, the length is a little short for everyday or work use that I left it behind. If we lived in a warmer climate I may have considered it. Protip: When trying on skirts, dresses or slacks make sure you have a seat and review the fit while seated. These pants are two legged miracle workers! I've put many a client into Rag and Bone slacks for work and have been saving up for a pair of my own. However, once I tried these on and saw the $50 price tag, I knew I needed to test them out. They may be the most comfortable work pants I have ever owned. While the fabric is not as thick and high quality as Rag and Bone, the high rise fit gives the right amount of smooth support and stretch. I ended up purchasing these in black to wear year round and will post an update on how they hold up in months to come. 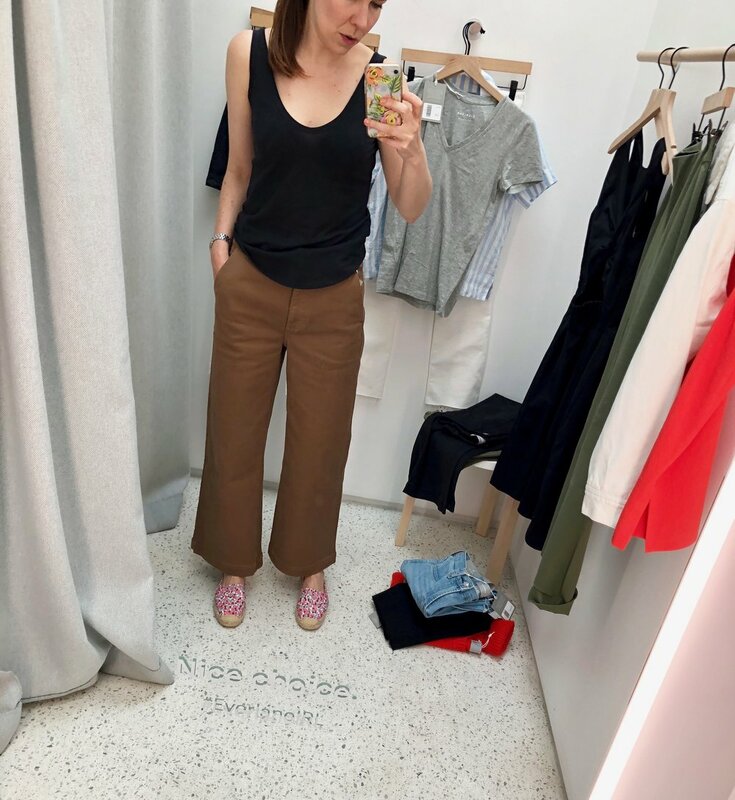 Posted on July 10, 2018 by Kimberly Gant and filed under SF Shops and tagged Everlane Summer 2018 Basics Crop Flare Summer Sweater.